With autumn fast approaching, many landowners are looking to add fall color to their landscapes. Unfortunately, many will choose tree varieties based on their fall foliage rather than the possibility of it being an invasive species. One tree that provides beautiful fall color is the Chinese Tallow tree (Sapium sebiferum (L.) also known as the Popcorn Tree. The Chinese Tallow is a fast growing deciduous tree. It can reach heights of 30 feet and its seeds resemble popcorn, hence the colloquial name. These popcorn shaped seeds, which can be spread by animals, and the root system sprouts make it very hard to control this non-native tree. It has spread to every coastal state from North Carolina to Texas, and as far inland as Arkansas. In Florida it has been found as far south as Tampa. The Chinese Tallow was listed in Florida as a noxious weed in 1998, which means that possession with the intent to sell, transport, or plant is illegal in the State of Florida. Unfortunately, this invasive tree is still being found in home landscapes due to its ability to reproduce rapidly, create great shade and deliver beautiful, reddish fall leaves. So even though the Chinese tallow has great fall foliage there are too many problems that come along with it to offer a recommendation. To read more on how to control Chinese tallow check out this fact sheet from the UF IFAS Center of Aquatic and Invasive Plants. 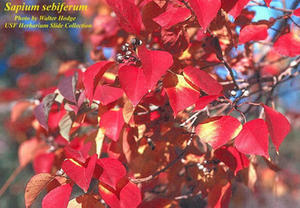 If fall color is important, there are many native species to choose from. To learn more about non-invasive native landscape plants with fall color, check out this publication on Florida native plants. It lists the Sweetgum, a native that is capable of producing great fall color. We Had Plenty of Rain; Why Are My Trees Dying? Most trees are not well adapted to saturated soil conditions. With nearly daily rainfall this spring and summer, sometimes in record amounts, the ground became inundated with water. When the root environment is dramatically changed by excess moisture, especially during the growing season, a tree’s entire physiology is altered. This condition may result in the death of the tree. Water saturated soil reduces the supply of oxygen to tree roots, raises the pH of the soil, and changes the rate of decomposition of organic material; all of which weakens the tree, making it more susceptible to indirect damage from insects and diseases. Additionally, with heavy rainfall there is erosion and sediment movement. Exposed roots or roots covered by excess soil add stress to plants. When the rain finally stops, often the tree’s system has been so compromised that it can’t perform the vital functions necessary to survive – it just dies. When the ground becomes completely saturated a tree’s metabolic processes begin to change very quickly. Photosynthesis is shut down within five hours; the tree is in starvation mode, living on stored starches, unable to make more food. Water moves into and occupies all available pore spaces that once held oxygen. Any remaining oxygen is utilized within three hours. The lack of oxygen prevents the normal decomposition of organic matter which leads to the production and accumulation of toxic gases such as carbon dioxide, methane, hydrogen sulfide and nitrogen oxide. Additionally, within seven days there is a noticeable root growth loss. 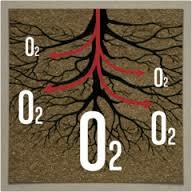 Roots only develop when soil oxygen levels are at 5% -15%. Over time, the decaying roots are attacked by pathogens. The loss of root mass from decay and fungal attack leave the tree prone to drought damage. After only two weeks of saturated soil conditions the root crown area can have so many problems that decline and even death are imminent. For plants to function there is a need for nutrient uptake. However, in saturated soil anaerobic organisms, primarily bacteria, replace the aerobic organisms that once existed in the soil. These bacteria convert the nitrogen into forms that are unavailable to plants. Also, manganese, iron and sulfur become limited because the soil pH has increased, making the elements unrecognizable. With little to no functioning root system, the trees in saturated soils do not have the means to uptake nutrients, even if they were available. When a tree experiences these anaerobic soil conditions it will exhibit symptoms of leaf loss with minimal to no new leaf formation. This usually appears two to eight weeks after the soil dries out again. Many trees will not survive, especially the more juvenile and mature trees. However, well established trees may still decline several years later, if they experience additional stresses such as drought or root disturbance from construction. There is little that can be done to combat the damage caused by soil saturation. However, it is important to enable the tree to conserve its food supply by resisting pruning and to avoid fertilizing until the following growth season. Removal of mulch will aid in the availability of soil oxygen. Basically it is a “wait and see” process. While water is essential to the survival of trees, it can also be a detriment when it is excessive. The Discovery Garden, showcasing new plants, in Gardens of the Big Bend at UF/IFAS North Florida Research and Education Center, Quincy. The University of Florida Institute of Food and Agricultural Sciences presents “Art & Garden,” Saturday October 5, at the North Florida Research and Education Center (NFREC) in Quincy. The free event will highlight creative ways to explore visual art and the art of gardening. Spend the day learning, discovering and engaging in fun activities for the whole family. Learn about floral arranging, container gardens, native plants that attract wildlife, and combating pests and invasive plants in your garden. Join a walking tour of the Gardens or take a trolley tour to view cold-hardy citrus and deciduous fruit. Watch plein-air artists painting on-site throughout the garden. Discover how to make mosaic stepping stones as well as birdbaths from large leaves. Children can spend the day painting pumpkins, planting sweet potato sprouts to take home, or painting, drawing, and making birdfeeders with staff and volunteers from the Gadsden Arts Center. An exciting array of trees, shrubs, flowers, organic produce and arts and crafts will be for sale. NFREC staff will be offering free soil testing and a plant disease clinic, so bring a sample of your soil or a clipping of a plant problem from your home garden. The day-long, family-friendly event is free and open to the public. University of Florida/IFAS, North Florida Research and Education Center, 155 Research Road, Quincy, FL. Located just north of I-10 Exit 181, 3 miles south of Quincy, off Pat Thomas Highway, SR 267. Presented by the University of Florida Institute of Food and Agricultural Sciences, North Florida Research and Education Center in collaboration with the Gadsden Arts Center, Gardening Friends of the Big Bend, Havana Garden Club, Quincy Garden Club, and the Tallahassee Plein-Air Artists. Sponsored in part by the Gadsden County Tourist Development Council. It has been a hot summer but Fall is right around the corner. Cooler temperatures and changing colors are a welcomed change in the panhandle of Florida. 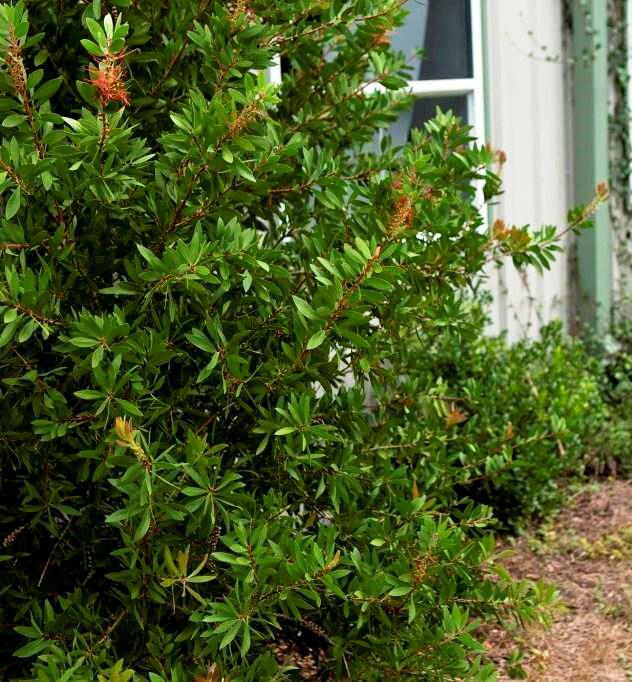 Fall can be a great time to spruce up your landscape with some new shrubs. It may be time for your landscape to receive a mini-makeover and to get a new look for fall and years to come. Perhaps some shrubs strategically placed will be what makes your outdoor living space pop. Proper selection and installation is key to health of the shrub moving forward. Climate – Be sure that the species will tolerate the climate you live in. Environment – Study the light level, acidity, and drainage of the planting site. Space – Account for the mature size of the plant before planting. This will keep you from having to remove the plant if the space is not adequate. Inspect the plant – Check for mechanical injury (scars and open wounds), cold injury, condition and shape of the canopy, and examine the root system. 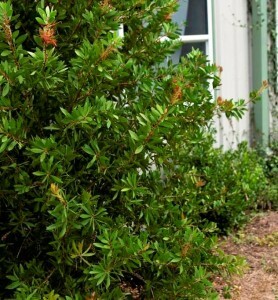 Now that the proper plant has been selected it is time to give the shrub the best chance for survival with proper installation techniques. Fall and winter is an ideal time for planting shrubs. The roots can develop before the tops begin to grow in spring. The following are the keys to proper establishment of container shrubs. Root ball preparation – Remove the container from the root ball and inspect for circling roots. If there are circling roots than make three or four cuts vertically to cut the roots. Pull some of the roots away so they will take on a new growth direction (massage the roots). Also find the top most roots as sometimes they are covered by extra potting media. Remove the extra potting media so the top most roots are exposed and become the top of the root ball. Wider is better – Dig the hole two or three times the diameter of the root ball. Proper depth – Make sure to dig the hole 10% less than the height of the root ball. In poorly drained soils dig the hole 25% less than the the height of the root ball. The top most roots should be slightly above the native soils. Backfill – Fill the hole with existing soil half way and tamp the soil to settle. Again fill the rest of the hole with the existing soil and tamp again to settle the soil. Do not place any backfill soil or mulch over the root ball as it is crucial that water and air are able to be in contact with the the roots. Aftercare – Irrigate daily for the first two weeks, followed by every other day for the next two months, and weekly until the shrub is established (For <2 inch caliper shrubs). 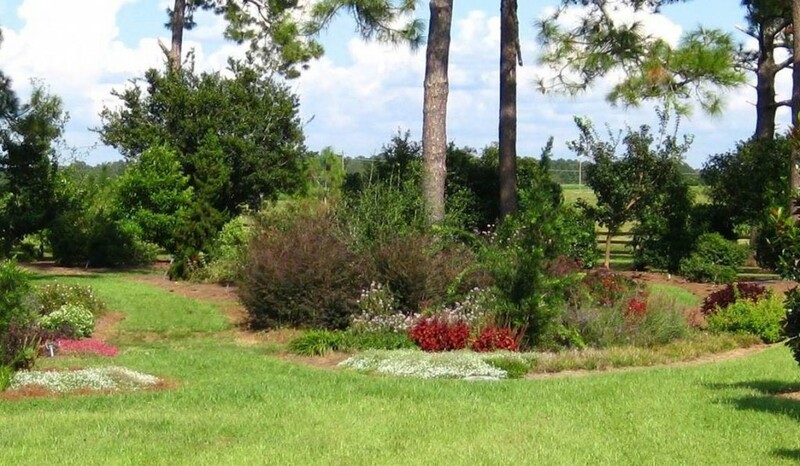 Specifications for Planting Trees and Shrubs in the Southeastern U.S.
Black, R.J. and Ruppert, K.C., (1998) Your Florida Landscape, A complete guide to planting & maintenance. Gainesville, FL: University Press of Florida. What’s Wrong With My Sago Palm? 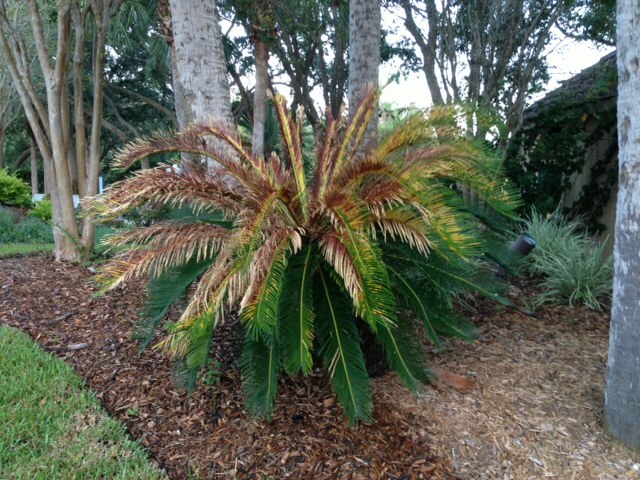 Is the newest growth on your sago palm turning yellow, brown, frizzy looking and dying – is it a pest or disease or something else? This sago palm is suffering from a classic case of manganese deficiency. When sago palms lack manganese, the newest leaves will develop yellow splotches or be entirely yellow. 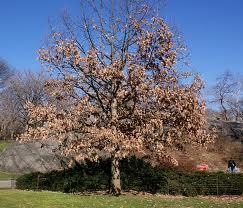 As the leaves die, they turn brown and take on a frizzled appearance. Sometimes the leaves or fruit may be smaller than normal. If left unchecked, the sago usually dies. Manganese is a micronutrient required by all plants for normal, healthy growth and is most available for plant uptake when the soil pH is between 5.5 and 6.5. 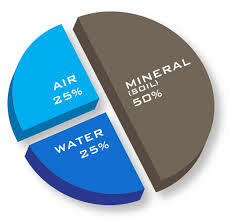 Soils in the Florida panhandle are often naturally low in manganese and then what available manganese is present can be unavailable for the plant to use if the pH of the soil is much above 6.5. Also, manganese tends to be leached from the soil when the pH is below 5.5. Soil pH and nutrient testing is useful to determine if soils are nutrient deficient. Contact your county Extension office for information on getting that done. If this is happening to a sago palm, the good news is that it is easy to correct. Manganese sulfate is readily available at garden centers, feed &seed stores and independent nurseries. Just make sure to get manganese sulfate and don’t confuse it with magnesium sulfate (Epson salts). The amount of manganese sulfate necessary to correct this deficiency will vary with its size, soil type and pH. Sago palms in sandy, acidic soils require less manganese sulfate than those in high pH soils. One ounce is sufficient for a very small plant in sandy, acidic soil. A very large sago in a high pH soil may require about five pounds, however. Spread the product evenly over the root zone and water in with about a half inch of water. The affected leaves cannot be cured but new growth should return to normal. If the new growth is still affected, an additional application of manganese sulfate may be needed. 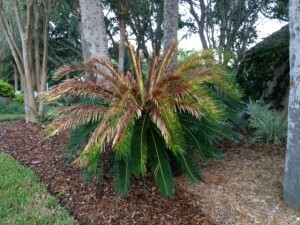 Once sago palms have suffered from a manganese deficiency, half the initial rate should be applied yearly to prevent the deficiency from re-occurring. Even though sago palms are not true palms – they are cycads – their nutritional needs are very similar to palms. Most of the time they grow well without any supplemental fertilization, but if they do need fertilizing, use a 8-2-12-4 (the fourth number is magnesium) palm fertilizer with micronutrients and avoid using other fertilizer products in their root zones.